As I’ve mentioned in a previous post, this seems to have been a bad year for leptospirosis in dogs in various areas. In at least a few location in Ontario, we are seeing a very high rate of disease, well beyond what we’ve seen before. I was giving some talks in Buffalo the other day and some people there reported a similar problem. Outbreaks have been identified in other diverse places in North America, including Nova Scotia and Arizona. It’s always hard to say, and some aspects of this vexing bacterial disease make it a challenge to investigate. This can certainly play a role, but I think it’s abundantly clear that there was a true increase in lepto cases this year, at least around here. New tests have become available and our ability to diagnose leptospirosis has improved, but not recently, so this also can’t account for the dramatic increase in cases. Leptospira can be carried by various types of wildlife, with rats and raccoons probably posing the biggest risk in this part of Ontario. Changes in the numbers, distribution and lifestyles of reservoir hosts can result in changes in exposure of dogs (and people). Booming populations of these wildlife hosts, movement of them into new areas and other things that increase direct and indirect contact (especially contact with urine from infected animals) could result in increased disease risk. There are many serovars (types) of Leptospira, and these can have different disease risks, hosts and infectivity. We don’t have a great handle on what’s going on in this respect, and it’s an area I’d love to study more. Changes in serovars that are included in vaccines or increases in strains not covered by vaccines could also result in more disease. However, in my experience, lepto is very uncommon in vaccinated dogs. I’m not sure I know of any vaccinated dogs that developed disease in the recent/ongoing situation. So, that’s probably not playing a significant role. Clearly, we need to figure out more about what’s going on. Hopefully lepto season is at an end here (with cold weather and tonight’s forecast of a blast of snow will help). That’s not necessarily true in warmer areas, and a big question is whether this fall has been an outlier or whether it’s the “new normal.” Only time will tell. From the pet owner’s perspective – because contact with urine from ubiquitous wildlife is almost impossible to preclude if your dog goes outside at all – the biggest thing that can be done is vaccination. It’s safe and effective, and while no vaccine provides a 100% guarantee, it’s a worthwhile investment to protect from a very nasty disease that can be very expensive to treat. For veterinarians, it’s awareness about the disease so that cases can be promptly identified, with treatment provided as early as possible. It’s also important to be aware of potential lepto cases so that proper infection control practices can be used to reduce the risk of zoonotic infection. 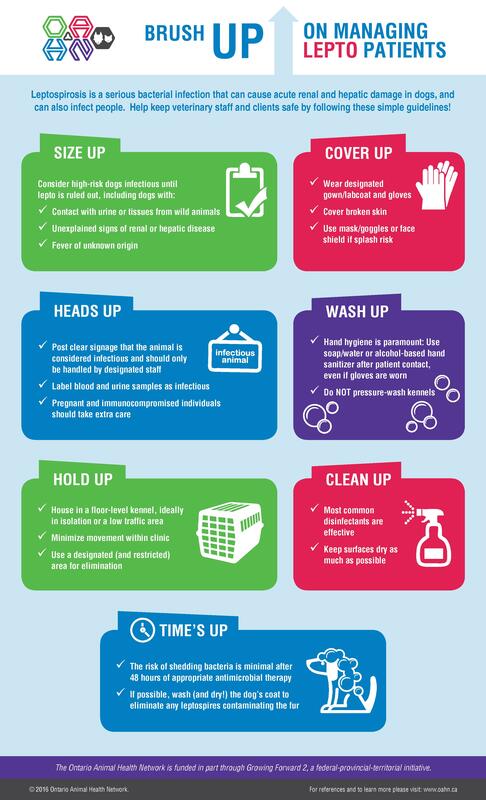 The Ontario Animal Health Network (OAHN) has produced a handy infographic for managing lepto patients in-hospital.